Edge simulators specialise in creating a totally bespoke and unique experience for your event and more importantly, your clients. 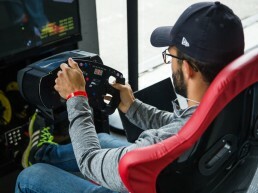 By offering the very latest in race car simulation along with first class race instruction, Edge simulators can make your event stand out from the crowd. We can brand the F1 simulator in your companies logos and colours, and also any back drops too. If you want to make your event really special, we can also brand the in-game car and circuit signage with your logo. Having nearly 10 years experience in the world of exhibitions we understand what our clients requirements are when it comes to trade shows….quality leads, brand awareness, and footfall! Having an Edge simulator as your trade stand centre pieces is a fantastic way of driving footfall to your stand. Not only will you have queues of people wanting to have a go, but its a great way of getting re visiting footfall back to your stand as people will want to see if their name is still on the ‘Top Gear’ style leader board. Think you have what it takes to beat ‘The Stig’? 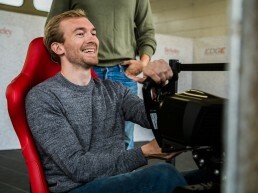 Edge simulators can host your very own ‘Top Gear’ style fastest lap time competition. We can connect multiple rigs together so your work colleagues can battle it out on the race track all at the same time! We can arrange trophies, prizes, and even ‘The Stig’ can make an appearance for the day, not only setting the target lap time, but also to cause mischief throughout the day. This coupled with one of our genuine F1 pitstop challenges, make for a fantastic, yet fun learning experience which will leave your team pumped and wanting to work with one another. Edge Events understand that if you are a budding racing driver, testing can be a costly, yet vital tool to aid your progression as a racing driver. Working alongside our sister company Edge Sporting Management (www.edge-sm.com) we can also provide one to one circuit familiarisation tuition. Why not come and spend a couple of hours learning the circuit that you will be racing at the week before you compete, for a fraction of the cost of a trackday/testday. Edge understand that promoting your product to maximise brand awareness is vital to any business. With this in mind we believe that any potential customers will truly remember your event and product after taking on the Edge Simulator challenge. Not very much! Each simulator requires around 2m x 2m (or 3m x 3m if you choose the triple projector and curved screen option). We will also need a few power sockets and double door access. We usually need between one and two hours to set everything up and run a test session before the racing begins in earnest.